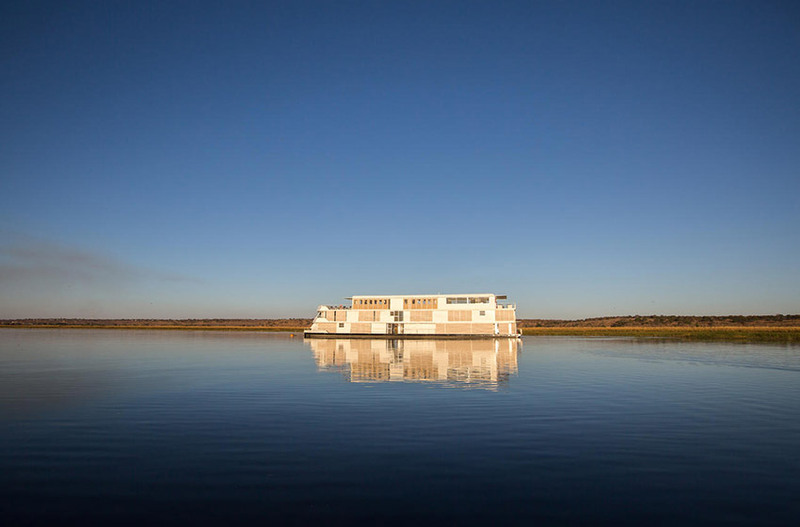 Moving along the banks of the great Chobe River, Zambezi Queen is a 5-star, 42-metre long luxury houseboat offering unparalleled sophistication in one of the most remote locations on the planet. 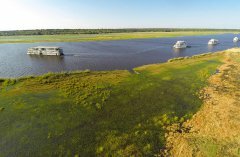 Best of all, as a guest on the vessel, you can enjoy a truly unique and adventurous river safari holiday while still being surrounded by complete comfort and elegance. 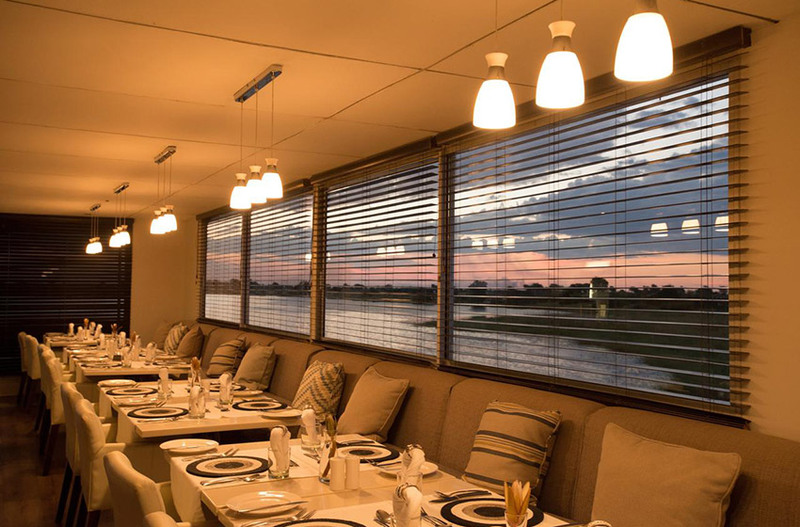 Each of the 14 suites on Zambezi Queen features air-conditioning and your own private balcony, where you can enjoy unobstructed views of the Chobe River and African landscape beyond. 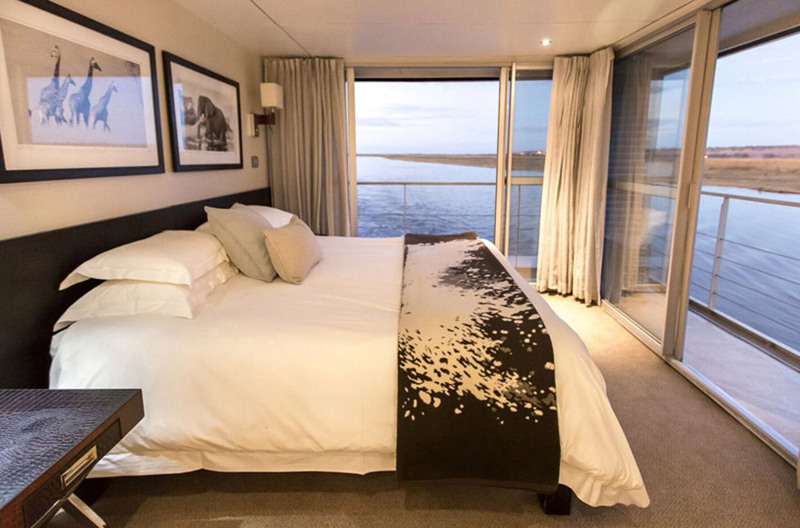 Wake up to the sight of an elephant drinking from the river, or watch a fish eagle take flight – all from the comfort of your own luxurious bed. 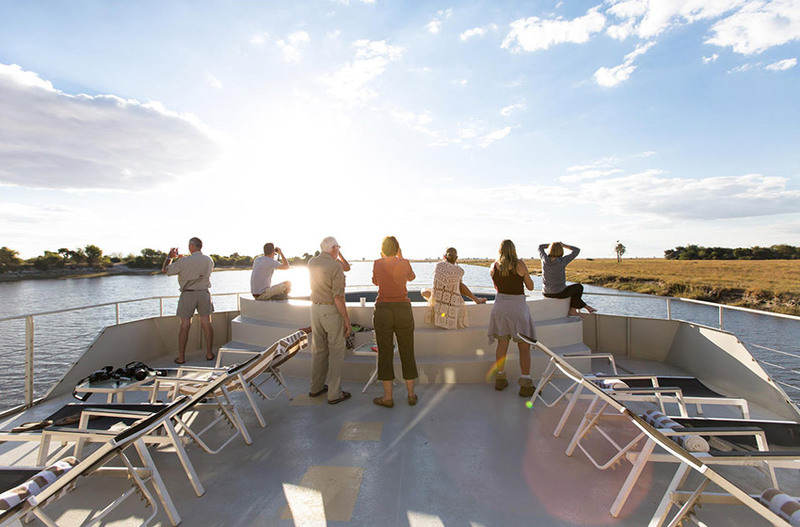 Unlike a land-based lodge, Zambezi Queen navigates roughly 25km of the Chobe River, allowing you to explore different vantage points and enjoy unparalleled game viewing. 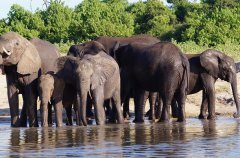 In fact, the banks of the Chobe National Park boast one of the densest populations of elephant on the African continent - estimated at approximately 120 000. The Park is also home to a large number of buffalo, leopard and lion, along with a variety of antelope and abundant birdlife. Celebrated South African fashion designer Jenni Button created the luxury houseboat's classic yet contemporary interior, using understated tones that make the wildlife on the banks of the river the star of the show. 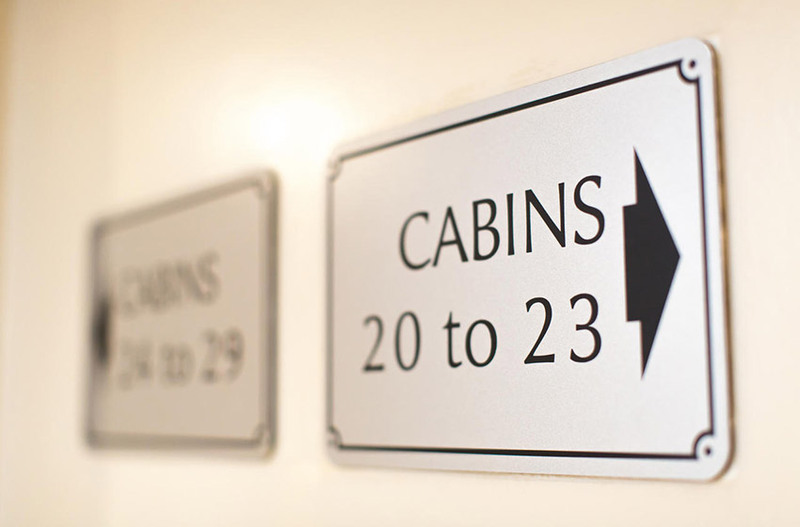 And, just like at any contemporary hotel, you can expect first class service at every turn. 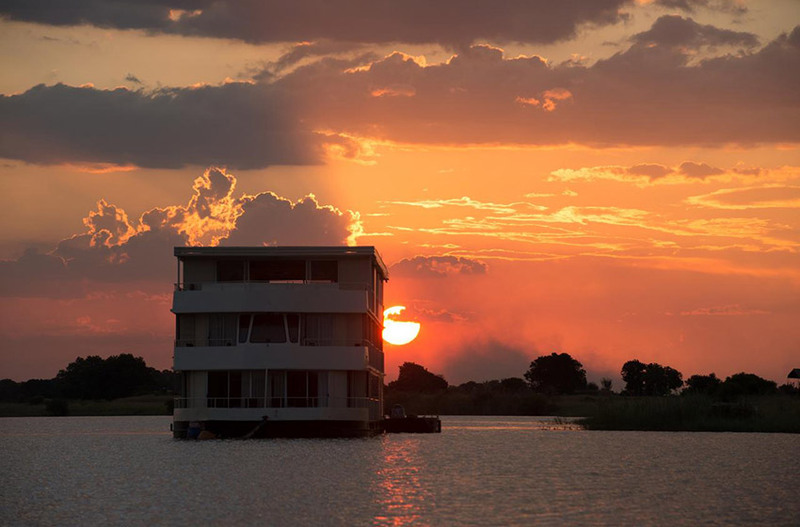 Whether you’re enjoying a gin and tonic on the upper deck at dusk or attempting to land your very first tiger fish, our highly experienced team will be on hand to meet your every need. Arrival & Zambezi Queen Departure Day. 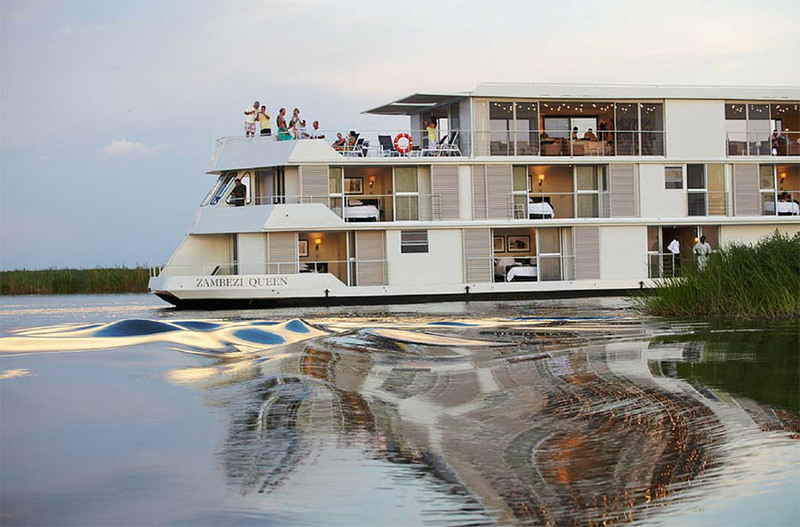 Zambezi Queen is moored on the Namibian side of the Chobe River. Please try to be there by 13h00 so that you can have lunch on ZQ. 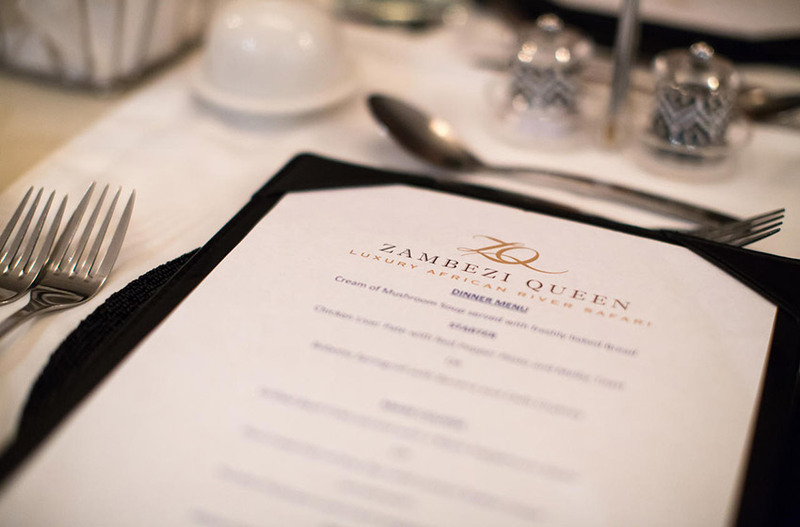 If arriving after 14h00, then a snack will be served on Zambezi Queen. One Child sharing with Two Adults, Child receives a 50% discount off the applicable adult rate. 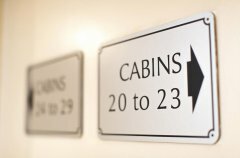 30% deposit is required within 7 days of confirmation in order to secure a booking. The full balance is required 90 days prior to departure. If a booking is made less than 90 days prior to departure, full payment is required to confirm the booking. 50% Balance is required 3 months (90 days) prior to ZQ departure date. If a group booking is made less than 90 days prior to departure, full payment is required to confirm the booking. Private road transfer rates on request. The attached Flight Schedule indicates that flight options to Zambezi Queen. 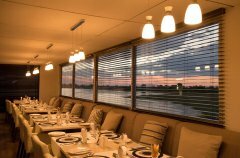 The flight costs are excluded from the Zambezi Queen rates. before travel and is in order. Few things are as romantic as the sight of the African sun, whether it is setting on the horizon or rising in the distance, it reveals the beautiful landscape and creatures that make Africa as diverse as it is. 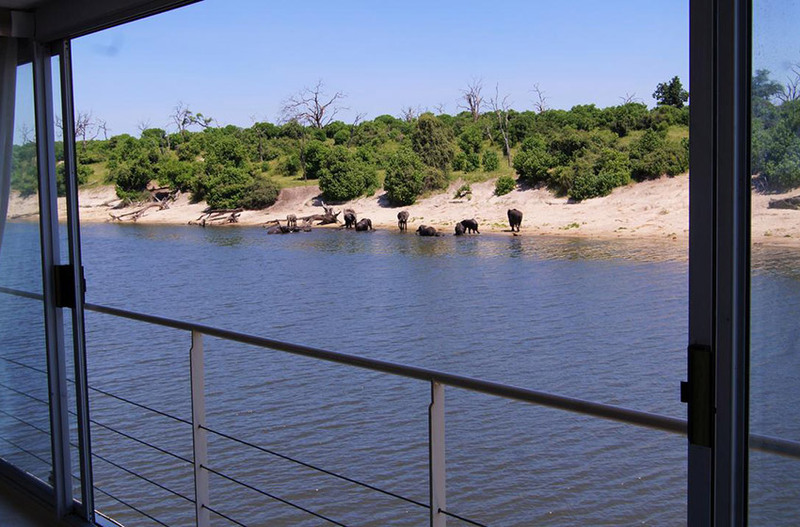 Imagine experiencing these astonishing views up-close, albeit from a river safari or on land. 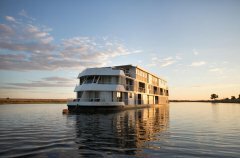 The luxurious Zambezi Queen Collection offers comfort and intimacy on board our houseboats as well as in our lodge, all the while treating couples to the sights and sounds of the great Chobe River. 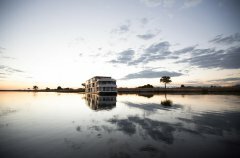 A honeymoon safari with the Zambezi Queen Collection of properties allows newlyweds the unique experience of water and land-based game viewing in an intimate setting. 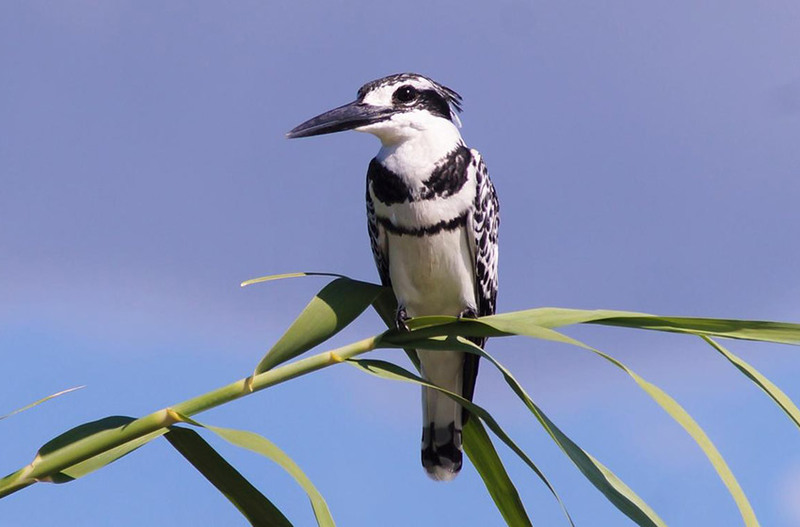 Our game cruises provide guests with the opportunity to see elephant, lion, buffalo and leopard (amongst other beautiful animals), while this stunning experience is coupled with the sound of birds as they chirp and cheep; with over 450 species of birds in the area it is a bird-watcher’s dream. 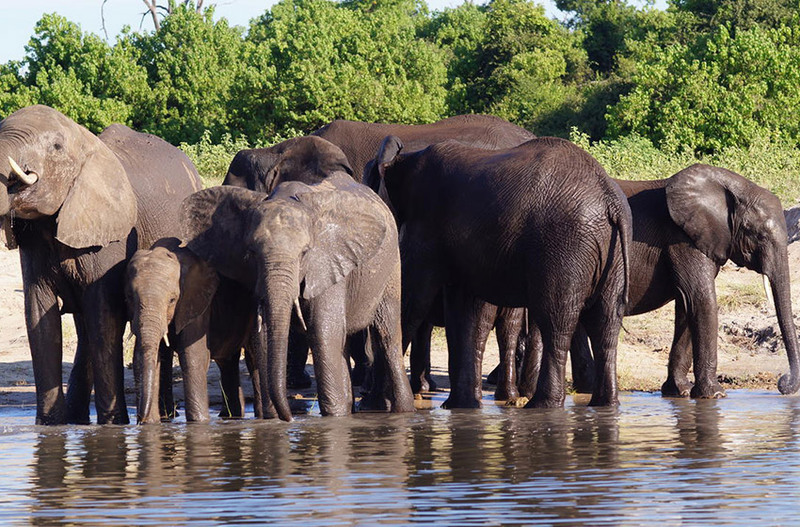 Cultural tours are also on offer, and land based game drives in the Chobe National Park are available on your day of departure, if time allows. 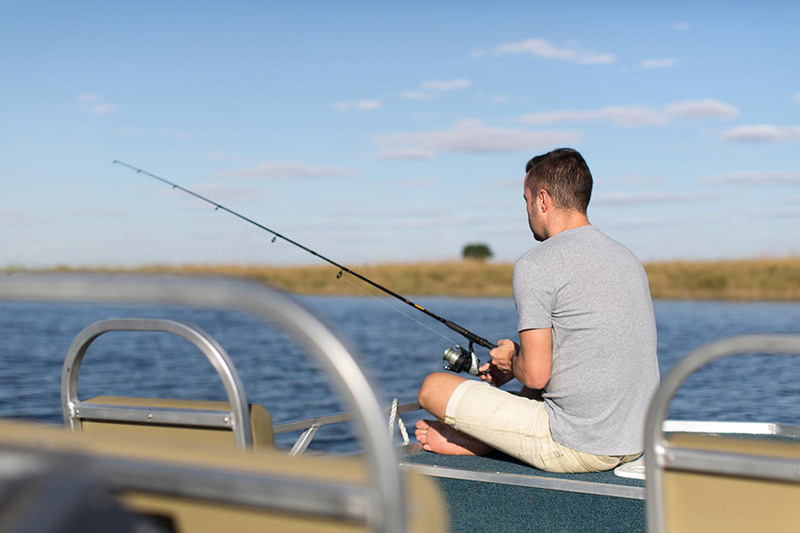 For the more adventurous couples, Chobe’s waters are world-famous for their tiger fishing, which you can choose to enjoy on a guided fishing safari as part of your package. 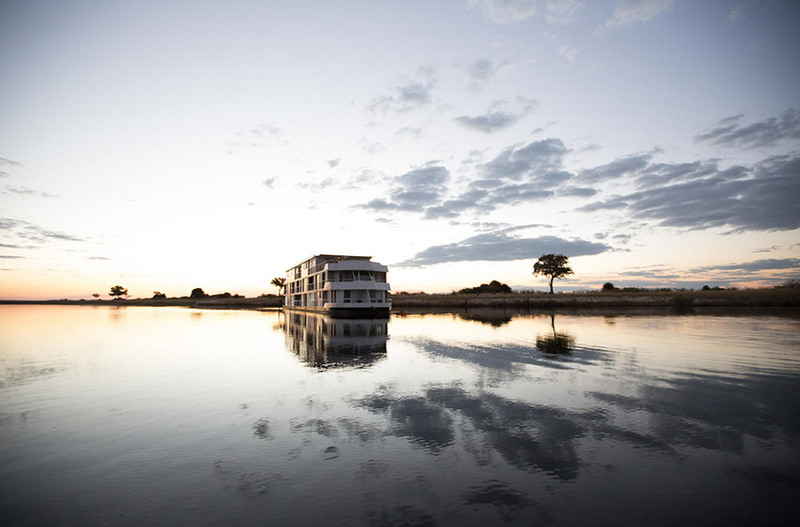 Experience the wonder of supreme luxury, expert service and an authentic Chobe adventure when you book your honeymoon safari with the Zambezi Queen Collection. Newlyweds enjoy a special discount of 10% on the bride’s stay, which is applicable all year round with a minimum two night stay. We know it’s the little things that make life special, and the same can be said for one of the most special getaways you’ll ever embark on. 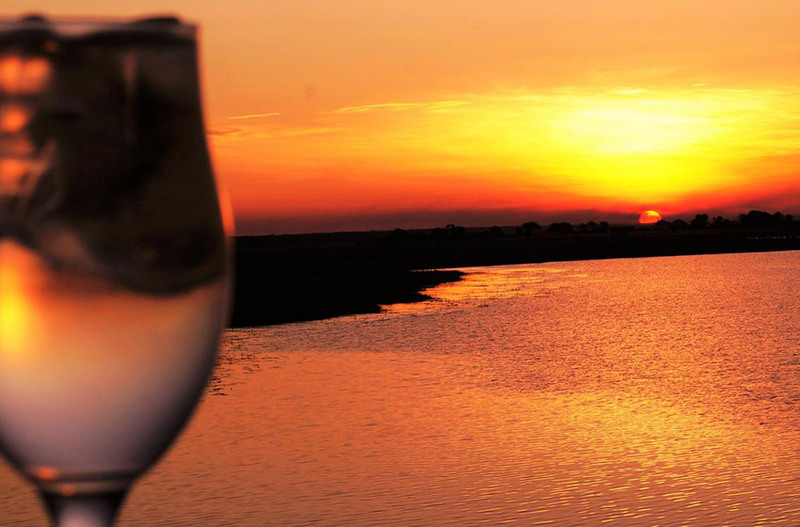 Our honeymoon safari package offers a complimentary bottle of sparkling wine and a gift, along with a romantic turndown. This special touch isn’t the only thing that will ensure an unforgettable honeymoon, as our standard inclusions will also thrill you and your beloved. Book your stay on one of our Zambezi Queen Collection properties today for the honeymoon experience of a lifetime. Simply call our expert consultants, send us an email or fill out the enquiry form below. 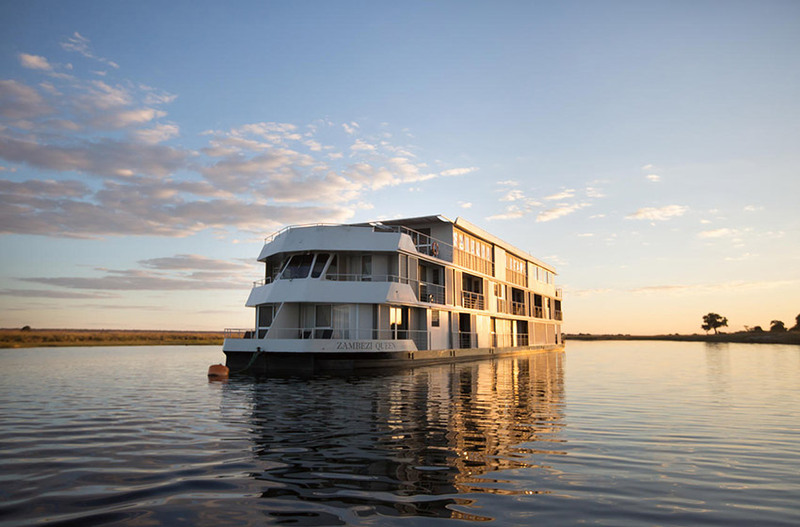 Gliding along the majestic Chobe River, bordered by Namibia and the Chobe National Park in Botswana, the Zambezi Queen Collection offers a safari experience unlike any other. 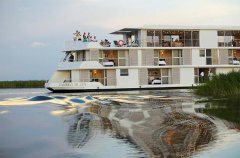 The Collection comprises of the luxurious Zambezi Queen and her three Chobe Princess houseboats, as well as the intimate tented Ichingo Chobe River Lodge. 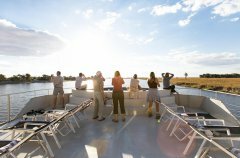 Now you can experience the best of both worlds with an exciting combination stay aboard one of our houseboats and at Ichingo Chobe River Lodge on the banks of the Chobe river and enjoy a 5% discount on your combined stay. Finding it difficult to decide? Let’s take a look at what you can expect from each experience. 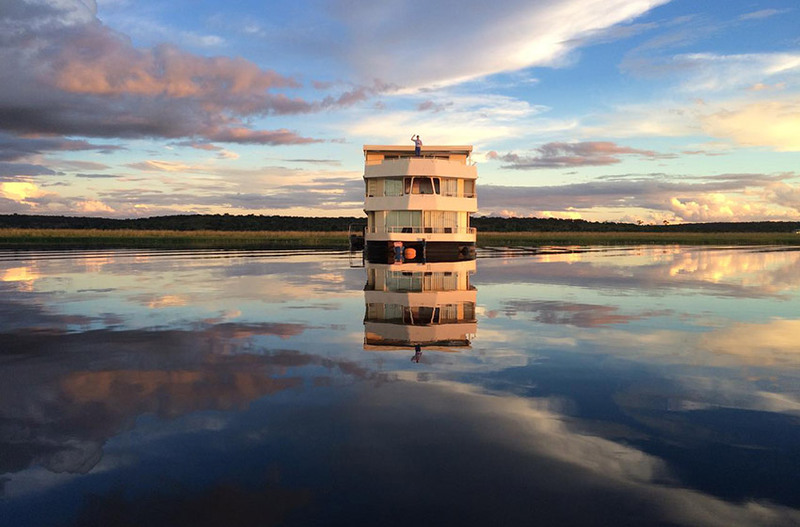 Step aboard a deluxe houseboat and start your extraordinary journey. 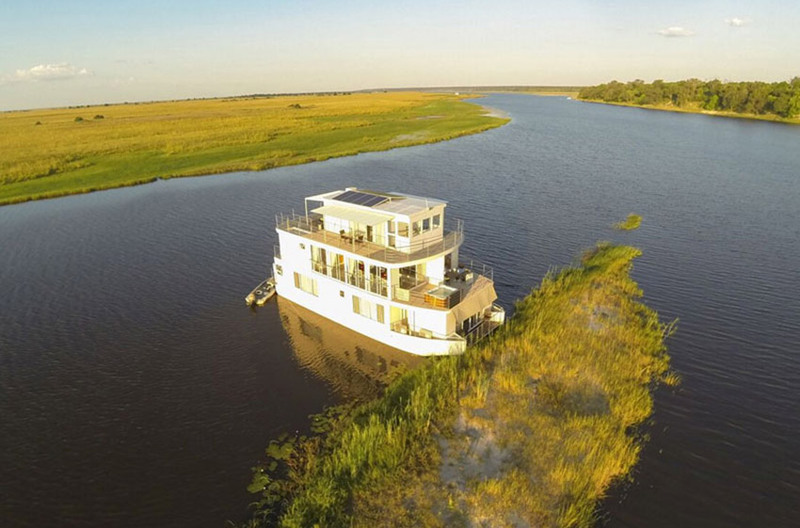 Lounge in the comfort of your stylish cabin and watch as abundant wildlife quench their thirst along the banks of the river. Cool off in the heat of the afternoon with a dip in the refreshing plunge pool. 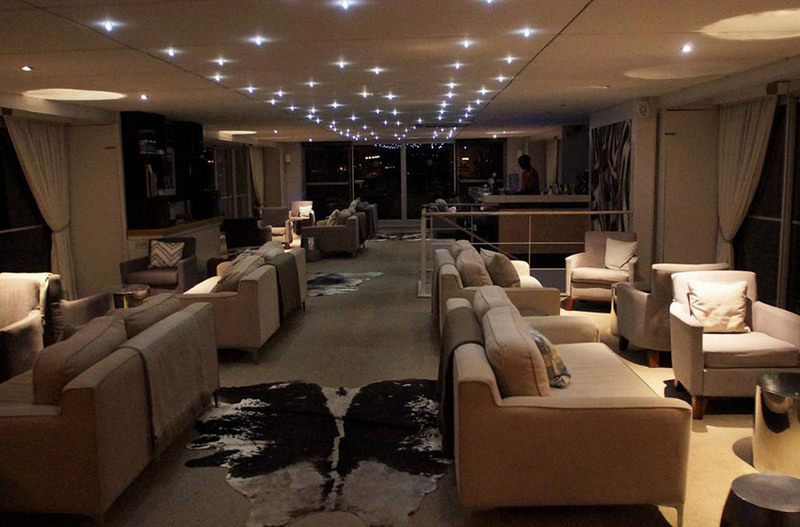 Then sip sundowners on the deck, followed by a gourmet dinner beneath the stars. 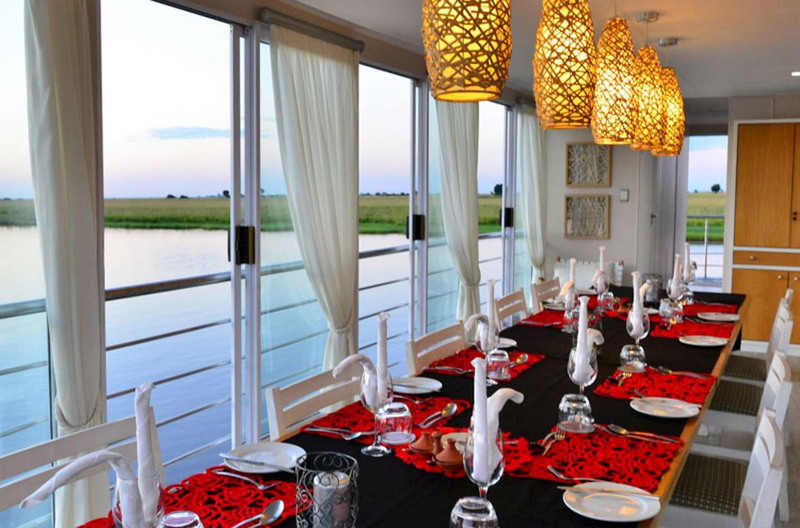 Whether you’re in search of a romantic escape for two, a memorable family getaway or an exclusive getaway with a group of guests, a river safari never fails to impress. 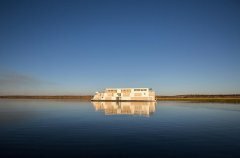 Struggling to decide which houseboat is best for you? 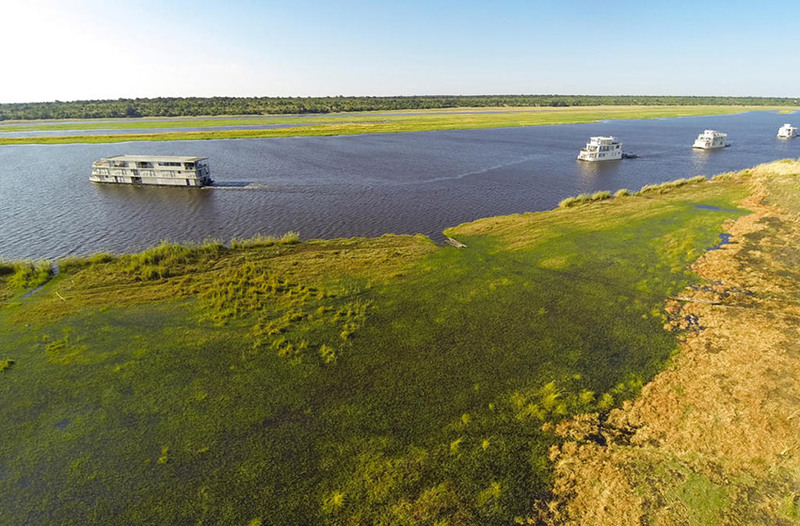 Compare our houseboat experiences here. Disembark on Impalila Island in Namibia where boundless natural beauty awaits. Sink into the comfort of a beautifully appointed Meru safari tent complete with air conditioning, en-suite bathrooms and breath-taking views over the river. 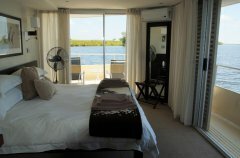 Relax on your private viewing balcony as you listen to the rippling sounds of the river. Laze beneath a sun-dappled tree-top canopy and glimpse exotic birdlife between the branches. Dine al fresco on the open-air deck, alongside a fully stocked bar and laid-back lounge area. A sparkling communal pool overlooking the river provides the perfect opportunity to refresh your senses. Families can take advantage of a larger tent accommodating two adults and up to four children, while seven other spacious tents are perfect for two adults sharing. 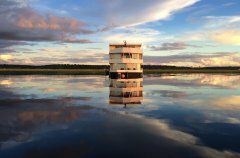 Book your stay on one of our Zambezi Queen Collection properties today to experience the unique magic of an African safari. Simply call our expert consultants, send us an email or fill out the enquiry form below. Book your fishing safari at Ichingo Chobe River Lodge today and save 5% on group bookings of 6 or more. 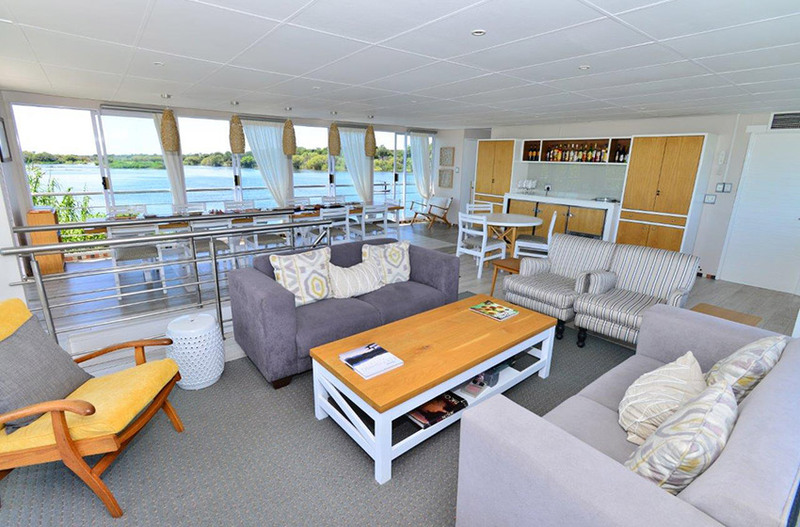 All internal areas on the top deck are protected by mosquito screens which allow for a comfortable environment when dining and relaxing. Smoking is permitted on the aft upper deck only. 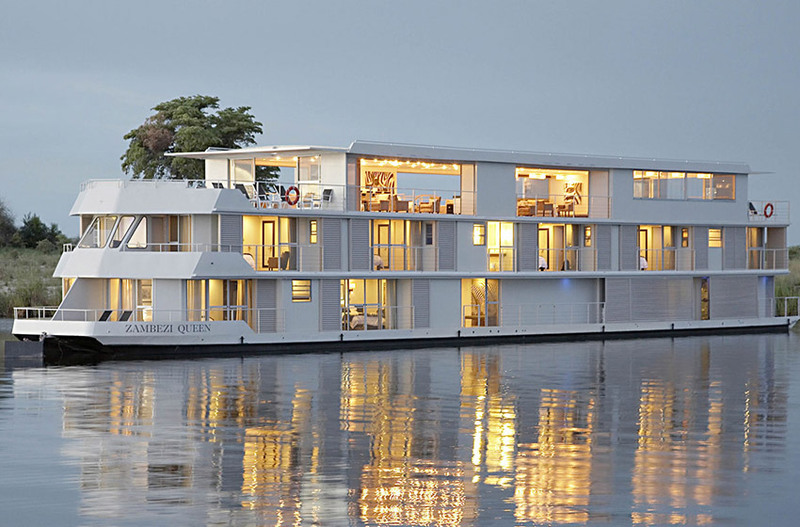 What is the nearest access point for the Zambezi Queen? Kasane. There are flights from Johannesburg to Kasane daily. How far is Kasane from Victoria Falls? 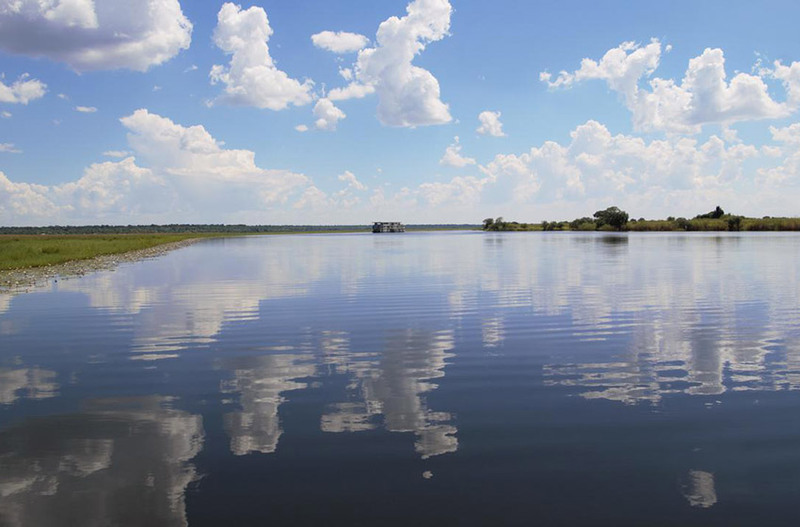 Approximately 90 minutes by road – it can easily be combined with a stay in Victoria Falls. Apart from the accommodation on-board, three meals daily, all scheduled activities and selected wines, beers, ciders and soft drinks. Road transfers to & from Kasane Airport are included in the rate. Does the Zambezi Queen sail on the Zambezi River? 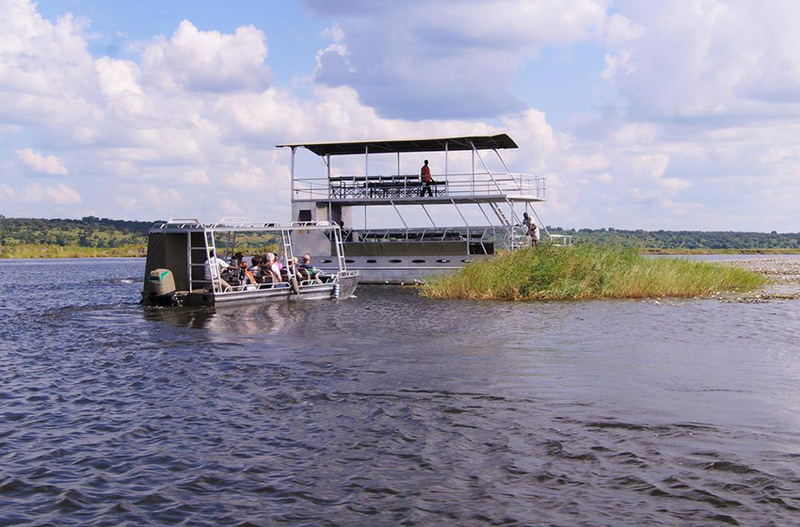 No, the vessel was named on the river it was built, but it sails on the Chobe River. The confluence of the Zambezi and Chove River is 5 km from the vessel's first mooring point. How far does the Zambezi Queen travel on the Chobe River? Light and comfortable especially for summer with a hat readily at hand. In winter a pullover is required for early mornings and evenings. Are guests seated together at meal times? No, unless they form part of a group booking. Are children permitted and from what age? Where possible, dietary requirements will be accommodated by prior arrangement. Halaal and Kosher meals are regrettably not possible. What currencies are accepted on-board? We accept Namibian Dollar, South African Rand, Botswana Pula and US Dollar. Yes, We accept Master and Visa cards. Is there a gratuity guideline? Gratuities are at the discretion of the guest. Our Guideline is USD 10.00 per person per day. Yes, tiger and bream fishing is possible on the Chobe River. We offer basic fishing tackle for keen fishermen. Is the water on-board safe for drinking? All water on-board is purified but we do recommend bottled water. before boarding the Zambezi Queen. 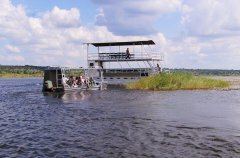 Zambezi Queen has its own professionally trained guides, highly experienced and resident to the Chobe area.